The CRISPR/Cas9 system has revolutionised scientific research over the last few years, offering an efficient method of genome editing. CRISPR/Cas9 utilises the cellular machinery used by bacteria to recognise and edit the DNA of invading viruses. It is formed of two key components: Cas9, an enzyme that can cut a double DNA strand at a precise point; and CRISPR, a short strand of RNA that guides the Cas9 enzyme to recognise and cleave at specific DNA sites. Cas9 restricts DNA at specific Protospacer Adjacent Motifs (PAMs), which is species-dependent (for example, 5′ NGG 3′ for Streptococcus pyogenes Cas9). Therefore, by coupling a custom CRISPR polymer (gRNA), Cas9’s restriction activity can be targeted to specific locations in the genome that contain a PAM region. 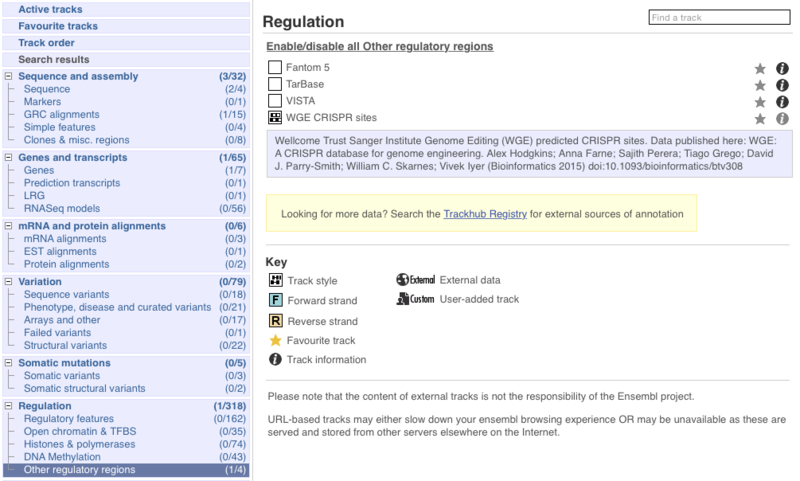 The latest release of Ensembl (Ensembl 85, July 2016) now includes annotated CRISPR/Cas9 sites predicted by the Wellcome Trust Sanger Institute Genome Editing (WGE) group for human and mouse genomes. Below, you can see an example of the WGE-predicted CRISPR site track added (to both the forward and reverse strand) of the genomic region containing the human BRCA2 gene in the ‘structure’ style. Each CRISPR site is labelled as a single green box, which appears as a single vertical line when viewing a large genomic region. From the example above, we have now zoomed into a specific region of interest. You can see the structure of each CRISPR site, with the filled green box matching up with the PAM motif and the un-filled box representing the potential gRNA binding sequence. Clicking on any of these individual CRISPR sites will open a pop-up window that provides you with more information about the specific genomic co-ordinates of the CRISPR site as well as a link to the WGE database. Previous Previous post: Ensembl 85 has been released! Next Next post: Ensembl Genomes 32 is out!